8 Dyer Hotel and chef Brandon Quesnell were honored to host a wedding reception for our good friends on Thanksgiving. We were able to secure the most perfect venue at Harbor Lounge and Brandon prepared a traditional Thanksgiving Dinner for 40 guests. With Liam McGonigle as the bartender and some of our finest Yolk team members as servers and cooks, the entire event was beautiful and delicious. If you are interested in having your event catered by Brandon Quesnell, please contact us at brandon@8dyer.com or call 508.487.0880. 8 Dyer Hotel is open year around in Provincetown. Offering a fresh-cooked breakfast every day and with a fireplace, jacuzzi and sauna, this boutique inn is a welcome getaway for a romantic weekend. From January 2 - March 31, 2017 8 Dyer Hotel is offering a Winter Special. Stay three nights and one night will be free. To book go online to https://secure.thinkreservations.com/8dyer/reservations and make your reservation. Under Special Rates, enter Promo Code "Winter Special" to unlock this deal. We offer a warm and relaxing retreat designed to take the chill off winter. Come stay with us! 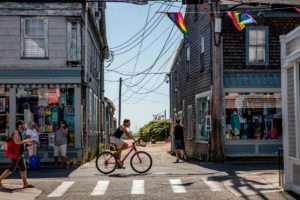 America's Favorite Towns -- Provincetown is way up there! Travel and Leisure ranks America's Favorite Towns. We know in your hearts Provincetown is number 1!